In March 2017, 15 activists locked themselves together around an immigration removal charter flight that was preparing to deport undocumented migrants from Stansted airport to Nigeria, Ghana and Sierra Leone. The action by the members of the campaign group End Deportations caused the flight to remain grounded and the runway to be shut for one hour and 20 minutes. They are now facing maximum sentences of life imprisonment for charges of committing a ‘terrorist offence’, under a law which has never before been used against non- violent activism. The charter flight that the activists were trying to prevent was set to remove 57 people. These mass deportation flights do not carry commercial passengers, only people that are being deported and in many cases double their number in private security guards. 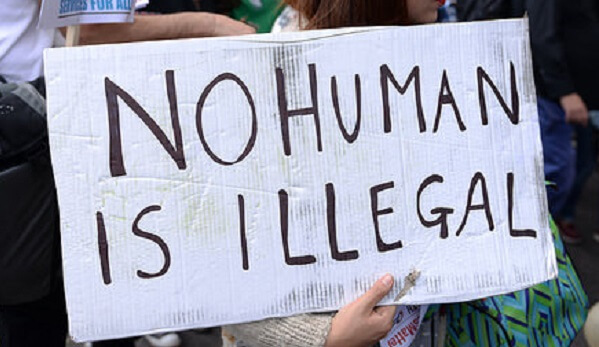 In many cases returning people to countries in which they have no family or connections and are at heightened risk of persecution. The activists reportedly entered the runway on the March 28 2017 and while some locked themselves together around the aircraft others set up a tripod behind its engine, displaying banners that read “mass deportations kill” and “no one is illegal”. Outbound planes were delayed and inbound flights were diverted to other airports, however no one was harmed. The activists reportedly dressed in pink to ensure they were visible, and carried out the non- violent action in a parking bay away from the main runway. They are being charged with intentional disruption of services at an aerodrome under the 1990 Aviation and Maritime Security Act, a law passed in response to the 1988 Lockerbie bombing. The defendants, aged 27 to 44, have all pleaded not guilty. Corporate Watch have argued that “perhaps the most brutal face of the UK border regime is the practice of mass deportation charter flights. Up to 2,000 people a year are loaded onto these secretive night flights, often shackled in “waist restraint belts” or “leg restraints”… “away from the public gaze in secretive night flights”. Green MP Caroline Lucas, writing for the Independent last year, described these mass deportation flights as “secretive, brutal, and legally dubious”. She drew attention to the serious doubt that has been cast over the Home Office’s ability to make fair decisions, with statistics showing that approximately 50% of Home Office deportation decisions are overturned at appeal, while in 2017 the Home Office’s “deport first, appeal later” policy was also found to be unlawful by the Supreme Court. Amnesty International has accused the authorities of “using a sledgehammer to crack a nut with this case” and is “concerned that the serious charge of “endangering safety at aerodromes” may have been brought to discourage other activists from taking non-violent direct action in defence of human rights”.